To learn about the vampire squid (which is neither a vampire nor a squid!). It is a cephalopod (related to octopi and squids) that lives in the deep ocean in complete darkness. It has blue blood and can glow in the dark. Pretty cool. 1) VIDEOS: Watch some vidoes of the vampire squid and read the provided info page. You can also read more using Internet; Wikipedia is a good place to start. 2) LAB: Try to demonstrate neutral buoyancy with a mixture of foam and clay in water. 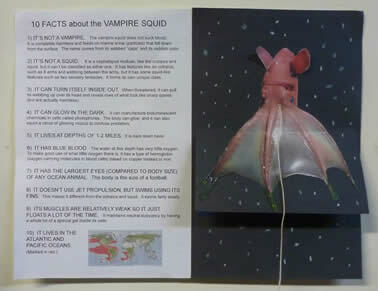 3) CRAFT: Cut and assemble a picture of a vampire squid with a flap that shows its underside. Also, dangling sensory tentacle, marine snow in the background and optional glow-in-the-dark paint on the ends of the tentacles. Time allowance: Allow about 15-20 minutes for each part: videos, lab and craft. 1) Access to YouTube videos. 2) Glass of water, foam, clay. 3) Copies of pattern pages, black piece of paper, tiny bit of string, some light colored pencils, scissors, glue stick.